Illustrated by Joan Hassall. Introductions by Richard Church. Sense & Sensibility, Pride & Prejudice, Emma, Northanger Abbey, Mansfield Park, Persuasion, Shorter Works. [Second and Best Folio Society edition. Fifth Impression thus]. 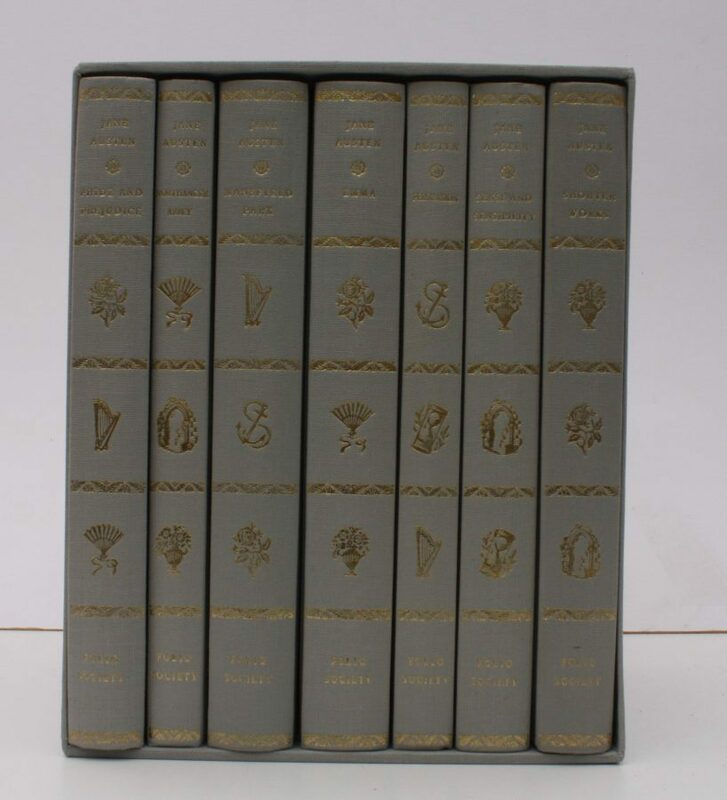 7 vols., 8vo., Fifth Impression thus, with wood-engraved frontispieces, numerous engraved illustrations in the text and pictorial endpapers; original patterned paper boards, grey cloth backs lettered and tooled in gilt, grey endpapers, a near fine set in publisher's board slip-case. The text is based on Chapman's definitive edition; the patterned paper boards were designed by Hassall. First published by Folio Society between 1957-1963, with the Second Edition reset in 1975. In this reissue several novels contain additional wood-engravings. Gilson, E281(P&P; 1957); E286(S&S; 1958); E300(MP; 1959); E307(NA; 1960); E328 (P; 1961); E340(E; 1962); F17 (SW; 1963).